Why I read this book: It was our first book pick at the new bookclub at work. I really liked this book and the production of it. So much so that once I was fully engaged I would turn it on and listen as I got ready for work. I'd listen until I had to turn it off then play it as soon as I could. I'd fall asleep every night lying in bed listening to the book. Hell, I even went to the gym to give me an excuse to read this book! 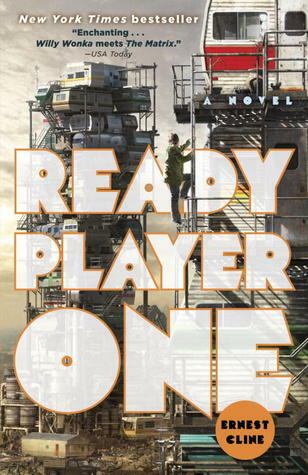 Ready Player One is the story of Wade Watts, an 18 year old senior who lives in a sort of dystopian America. It's 2044. The world ran out of fossil fuels and the unemployed roam, homeless and starving. People live in trailer parks where the trailers or RVs are just stacked on top of each other. The only happiness in anyone's life is a virtual reality video game called the OASIS. Wade is known in the OASIS as his avatar Parzival (at least that is how I think it is spelled... I've never seen it written). He pretty much lives in the OASIS, even going to school there. But his primary goal and that of so many others is to participate in the contest. The contest was started by James Halliday, the creator of the OASIS, on his death with a video challenging the world to find three keys and pass through three gates all hidden in the game. The winner would be his heir, gaining his fortune and pretty much control over the OASIS. The story is centered around this contest as well as his relationships with his friends whom he has only interacted with online: Aech (said like the letter H) and Art3mis. This book was an amazing surprise. I loved all of the questions it brought up with the parallels drawn to our current world and where we could end up technology wise. Not only that but it brought up some interesting points about identity and what makes a relationship real? We spend a lot of our time online interacting with people we may never have met face to face but does that make them any less of a friend then one we party with on Fridays? The book itself is heavily based in the 1980s and cult geek culture. This was hugely entertaining. The contest pretty much brought about a resurgence of the 80s, so while set in the future it’s also steeped a very relatable past. I loved all the references to old video games and movies. Cline's creative ingenuity of the worlds both in and out of the OASIS are staggering. Like, who wouldn't want to take the place of their favorite movie character and act out the movie? That would be the best virtual reality game ever. Also, being an Ohioan (like the author) I loved the spotlight Ohio has in this world as the technological mecca. It made me chuckle. The themes in this book are pretty heavy actually, the primary one being the role technology plays in our life. I mean in this world, Wade and pretty much the rest of the world live in a virtual place where so many things are possible. In fact, the real world adapts to make the fake world easier to access. It's a chilling thought. Completely replacing reality, touch, face to face interaction with a fake version of it. Don't get me wrong, virtual reality is cool and I could totally see myself doing the same things as these characters. That's why this book was so good. It felt like everything in it could happen. That said I had a few issues with the length of time in the middle not focusing on the contest and instead on a boring romance subplot. And I also thought in the beginning that Wade was a little too smart for me to believe, but as the book went on and I thought about the level of commitment these people have to the contest, I believed it more. I am being purposefully vague here because this book is awesome, and I don't want to spoil it. If you are even remotely intrigued by this concept, please check it out! One final word on the audiobook. Wil Wheaton was the best narrator I could have hoped for in a story like this. His inflection and commitment to the story had me believing his was Wade. There could not have been a better narrator for this book. Though sometimes, hearing some of the dialogue or certain phrases did make me laugh out loud. I think overall though I enjoyed this being an audiobook because it forced me to slow down and actually listen to it. If I would have had this book in written form, I would have devoured it in a day. So yeah, read this. Or listen to it. It is totally worth it. I bet this one was so much fun to listen to! It sounds like such a cool book. I think I would enjoy all the nerdy 80s references and the whole plot! This was a great review for what sounds like an awesome book. Yeah. It was fortuitous that the book club picked this. I was so lucky, because I would have missed an amazing debut! WHAT??? I didn't realize Wil Wheaton is the narrator on the audio book. I am geeking out over here. Plus I loved this book! That made me solidly want to listen to the audiobook! It was pretty amazing. Especially when he was reading his name as Geek King or whatever he was. I know it wasn't King of the Geeks, but it should have been! Will definitely be picking up a copy of this some time soon! Sounds like such a cool read. It is! I hope you like it, too! The audio of this came recommended by a coworker. I was pretty much sold at Wil Wheaton. I am so happy to have discovered this one. I LOVED it and keep recommending it! Gah! I read this and LOVED it, but now I'm angry at past self for not listening to the audio. Wil Wheaton! What a waste. May have to reread on audio. I loved this one when I read it, but I've head such good things about the audiobook, I'm mightily tempted to try it that way as well! I'm listening to this one right now and enjoying it so far. I too think Wil Wheaton is amazing. Great review! Loved your review! I just finished this book myself and when o saw you had a review on it, I decided to check it out! ! I loved the book as well, but I agree with you about the romance in the middle. Anyways, I just wanted to thank you again for checking out our blog!